By car from Ambleside take the road signposted to Langdale, and drive up as far as Skelwith Bridge, where you follow the Langdale sign up right. Travel up, still roughly along the line of the beck, until you reach Elterwater, on your left. Do not turn off. Carry on towards Chapel Stile. You will see the Langdale Hotel Sign ahead of you, and the Cylinders land is on your right. The entrance is directly opposite the main hotel gateway, battered green gates on your right. There is plenty of parking space inside. Lift up the latch and the gates open outwards towards the road. Please close them behind you to keep the sheep out. Opening hours at 10 am to 5 pm, but if you are coming a distance please ring or email first to make sure there is someone here, as if we are away the gate will be locked. Please keep dogs on a lead, and do not pick or damage plants or fungi. Please feel free to contact us, or enquire about making a donation, by using the form below. Thanks for your interest. 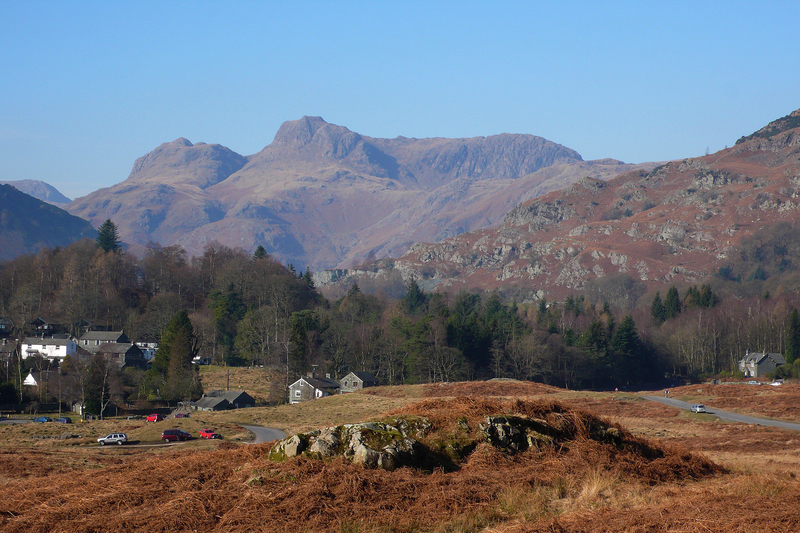 Elterwater and the Langdale Pikes. Cylinders and the Merz Barn are amongst the trees on the right.